Adventure Sketchers! Draw, Play, Create is an epic adventure game that children can customize with their own drawings, voice recordings* and choices they make along the way. 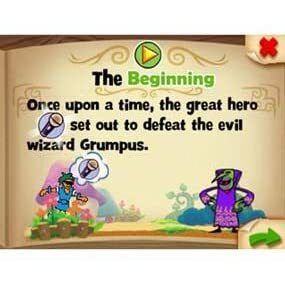 Infinitely replayable, the game introduces story elements such as character, setting, problem and solution, and challenges children to create—and then recreate—the adventure by reassembling the scattered pages of the Book of Wonder. As players embark on a daring quest to vanquish the evil wizard Grumpus and save the Kingdom, they build drawing and storytelling skills and create art that they can save for future gameplay. *In-game microphone feature is not compatible with Leapster Explorer. Pretend Play: Pretend play offers a creative outlet that strengthens a child's understanding of the world as he acts out stories he knows and situations he observes in the adult world. As imagination grows, dramatic play becomes more complex. Storytelling: Children learn the patterns of oral language and stories by listening to and repeating what they hear and read. Story building: Children learn to build stories by combining narrative elements such as character, setting, problem, etc. Drawing: As they draw, children develop spatial reasoning, visual acuity, and hand control - skills which will ultimately help them write letters.